Project submitted by: Markus Scherzinger, Illya Gents and Gerardo Garcia. The goal of this project was to explore and learn about robotic exoskeleton technology by redesigning several parts of the EduExo to extend its functionality. The work was submitted to us by Markus Scherzinger, Illya Gents and Gerardo Garcia. It was a student project called "ELEX - development of an elbow exoskeleton" they conducted as part of their Bachelor studies in robotics at the Hochschule Furtwangen University in Furtwangen, Germany. The project was supervised by Prof. Hans-Georg Enkler. The project might be of special interest to you if you would like to redesign mechanical parts, or extend the electronics of your EduExo. The team kindly provided us with their project report that contains many technical details, the student's perspective and their step-by-step progress. You can find a download link below. Thank you very much for sharing your results! 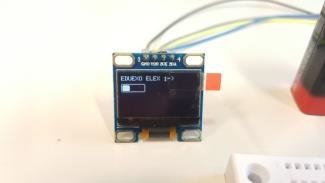 The first major alteration was a mechanical redesign of most of the EduExo parts, to allow size adjustments and integration of the electronics on-board. 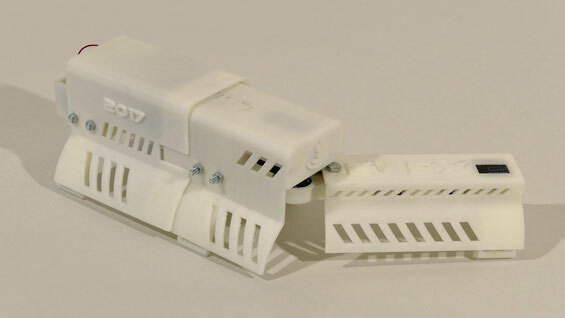 Mechanical design work was conducted using the software SolidWorks, and the parts were printed in an Alphacam Type Dimension bst 768 3D printer. The redesign included a new upper arm segment with a length adjustment mechanism. 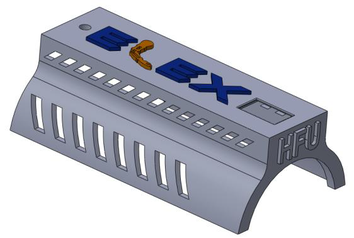 Another major mechanical extension was the addition of housing for the upper and lower arms that enable the integration of all electronic components into the exoskeleton arm. Besides the new mechanical parts, the team also worked on implementing new electronic components. The main new feature was a display that provides information such as remaining battery power to the exoskeleton user. 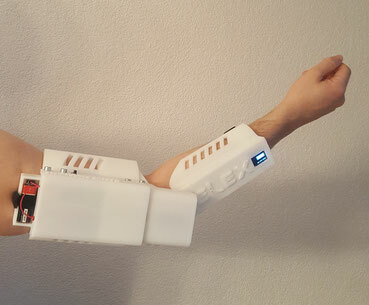 Overall, the work resulted in an extended elbow exoskeleton that self-contained all the electronics and a length adjustment mechanism. If you want to learn more about the project, please find the original report below. In the report, the authors provide many details about their motivation and the technical implementation. If you are interested in expanding your EduExo as well, this document could be a good starting point! The student's project report. Provided with permission by the authors. Copyright is with the authors of the report. Yes they did a very nice job. You can contact the supervisor of the project (Prof. Enkler), we linked his website at the beginning of the project description. His website is in German but you can write him in English of course.